Should you incorporate any of these into your investing strategy? The January Effect was first noticed by investment banker Sidney Wachtel in 1942 and the theory proposes that a pattern existed in the price of stocks in the last few trading days of December and the first few weeks of January. During this period, particularly starting in January, the theory is that stocks – especially smaller cap stocks – tended to rise. One study of historical data from 1904 through 1974 discovered that the average return during January was five times larger than the average return for other months. Another study showed that small cap stocks (as represented by the Russell 2000) outperformed large cap stocks (as represented by the Russell 1000) by 0.8% in January, but lagged behind large caps for the rest of the year. Starting with the year 2000, however, the results have been mixed: in the seventeen Januarys since 2000, almost half the time the market lost ground during the month of January. One reason behind the historical January Effect is a consequence of tax-loss selling, in which investors sell stocks that lost money at the end of December, in order to take losses as tax deductions. Because so many of these stocks that lost value were sold in late December, they were – in theory – available at a discount in early January. Another purported cause of the January Effect was the payment of year-end employee bonuses, which employees then dutifully invested in the stock market, making the market more active and causing prices to rise. In recent years, the January Effect has become much less pronounced – to the point of not really existing. The reason is pretty straightforward: once everyone knew about it, the “smart” investors started buying in December instead of waiting for January. In other words, the markets adjusted. In addition, since so many investors use tax-sheltered retirement plans, like IRAs and 401(k) plans, there is no special reason to sell a stock for the purpose of deducting losses. Back in 1972, Yale Hirsch of the Stock Trader’s Almanac proposed the existence of the Santa Rally – and it’s been a constant source of eggnog-fueled debate for decades. The Santa Rally refers to the general tendency of the U.S. equity markets to post gains in trading days between Christmas and the first two days after New Year’s. The Stock Trader’s Almanac found that since 1950, the average movement in the S&P 500 Index during this period of seven trading days has been a gain of 1.4%. Since 1928, we have had 90 Januarys and 89 Decembers. And there have been 56 positive Januarys and 34 negative Januarys compared with 65 positive Decembers and 24 negative Decembers. Hmm. The December Effect for Small Caps? 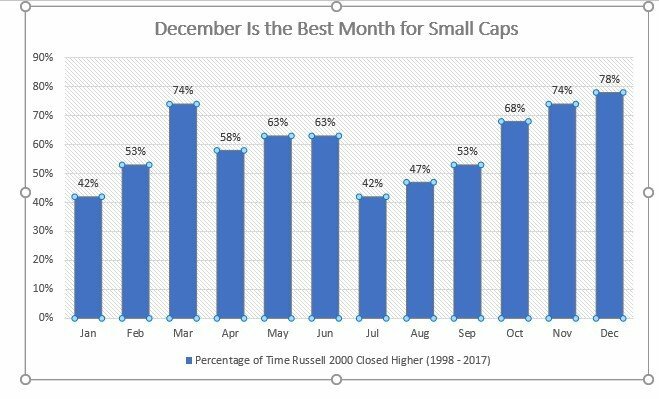 Look at the chart below and you will conclude that December is the best month of the year for small caps with a 78% win-rate. And you will also conclude that January is one of the worst months for small caps. If you incorporate the January Effect, or the Santa Rally or the December Effect into your investment theory, then you may also want to make a trip to the zoo and visit the monkey cages. Because in 1973, Princeton University Professor Burton Malkiel claimed in his best-selling book, A Random Walk Down Wall Street, that “a blindfolded monkey throwing darts at a newspaper’s financial pages could select a portfolio that would do just as well as one carefully selected by experts.” And guess what? According to a 2013 publication from Research Affiliates, with 100 monkeys throwing darts at the stock pages in a newspaper, the average monkey outperformed the index by an average of 1.7% per year since 1964. Having a monkey toss a coin might work just as well as using January data to predict yearly performance. A bad first day, bad first week, or bad first month simply do not tell us much about how the market will perform over the course of the year. Every year has hundreds more trading days, 51 more trading weeks, and 11 more trading months. So many different economic, political, weather, and other factors can pop up at some point during the year. Current concerns about natural disasters, interest rates, tax reform, the price of oil and currencies will be replaced by other concerns, and new economic news will gain prominence. The initial market results for 2018 matter. Investors should not ignore poor market performance for individual stocks or market segments. When it comes to predicting how market will perform for the rest of the year, however, results in January appear to be no more important than results at any other time.